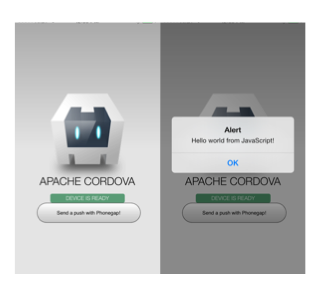 In this tutorial, you’ll use a sample app (iOS, Android, or PhoneGap) to send yourself a push notification with the Usergrid push notification API. You’ll register with a push notification services (Apple APNs or Google GCM) to create the required security certificate or key, create the required Usergrid notifier to send a message, then modify, compile and run the sample app to see push notifications in action. troubleshooting tips, see Adding push notifications support. 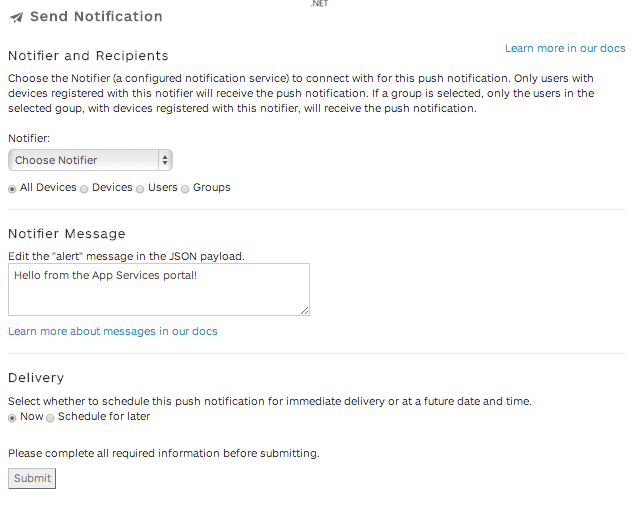 Before you can add support for push notifications, be sure that you’re set up for the requirements described in Adding push notifications support. To send push notifications you must register your app with the push notification service that corresponds to your app’s platform. Once registered, the service will provide you with a certificate or key that you will provide when creating an Usergrid notifier. 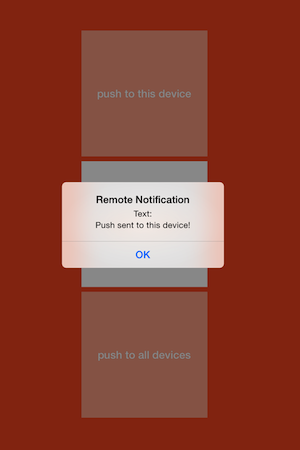 Notifiers are entities that carry your push notifications to a notification service. Once a notification service has verified that your notifier contains valid credentials, it will deliver your push notification to the devices of your app’s users. In this step, you’ll open your sample app of choice in your IDE and configure it. The Android sample app can be run with an emulator, included in the Android Developer Tools. The iOS sample app must be run on an actual iOS device. Open the iOS sample app with XCode by opening its .xcodeproj file. notifier: Name of the notifier you created. (For the sample, make sure it’s “appledev”.). Plug your iOS device into your development machine. In Xcode, select Window > Organizer to open the Xcode Organizer. Under Devices, select the device you plugged in, then click Add to Member Center. You may be prompted to log in with the Apple ID associated with your Apple Developer account. If prompted, select a Development Team to use for provisioning. This will be a team you’ve registered at the Apple developer portal. Log in to the Apple Developer portal and create a provisioning profile that includes the App ID you chose when you registered the sample app with Apple APNs. For more information on how to create a provisioning profile, see “About provisioning profiles” below. Download the profile and add it into Xcode Organizer, in the Provisioning Profiles group under your plugged-in device. In Xcode, select the Project Navigator, then select the project root folder. In the General tab, in the Bundle Identifer box, enter the App ID associated with your provisioning profile. In the Build Settings tab, under Deployment, for the iOS Deployment Target select the iOS version on your connected device. The version is displayed in the Xcode Organizer. 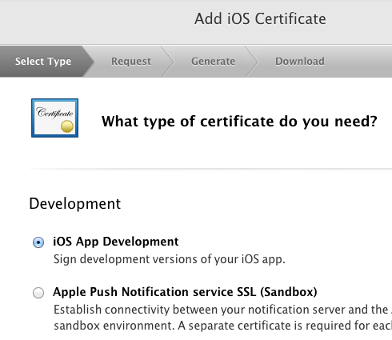 In the Build Settings tab, under Code Signing, under Code Signing Identity > Debug, select the Apple signing certificate corresponding to your developer identity. Click Run to launch the sample on your iOS device. When the “codesign wants to sign using key in your keychain.” dialog is displayed, click Allow. The project is now built, and the app is installed on your device. 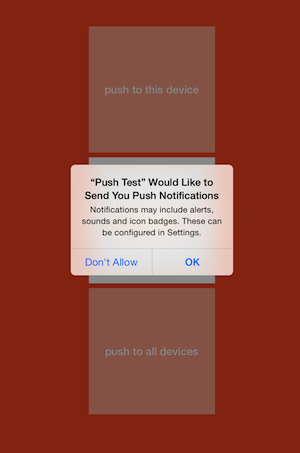 The first time you run the push sample app, your device will ask permission to allow push notifications. Tap OK. In the app, tap the push to this device button to send yourself a push notification. If you have configured your notification to go to multiple devices, tap the push to all devices button to send the push notification to all devices. Open the iOS PhoneGap sample app with Xcode by opening its .xcodeproj file. notifier: Name of the notifier you created. At the top of the IDE, ensure that the name for your plugged in device is displayed next to the target name, then click the Run button to launch the sample on your iOS device. If the “codesign wants to sign using key in your keychain” dialog is displayed, click Allow. In the app, tap the Send a push with Phonegap! button to send yourself a push notification. For iOS app testing, you need a provisioning profile that’s associated with an Apple ID. You set up the provisioning profile in the Apple developer portal, download the profile, and import it into Xcode. Make sure you have the latest Android SDK installed in your IDE, and that Android APIs have been installed via the Android SDK Manager. GCM_SENDER_ID: Your Google Cloud Messaging (GCM) project number, as described in the Tutorial: Push notifications sample app. USER and PASSWORD: Optional. If you created your notifier in an app other than “sandbox” (which doesn’t require authentication), enter the username and password of one of your Usergrid admin users. In AndroidManifest.xml, be sure the proper Android permissions are included, such as READ_PHONE_STATE and VIBRATE. 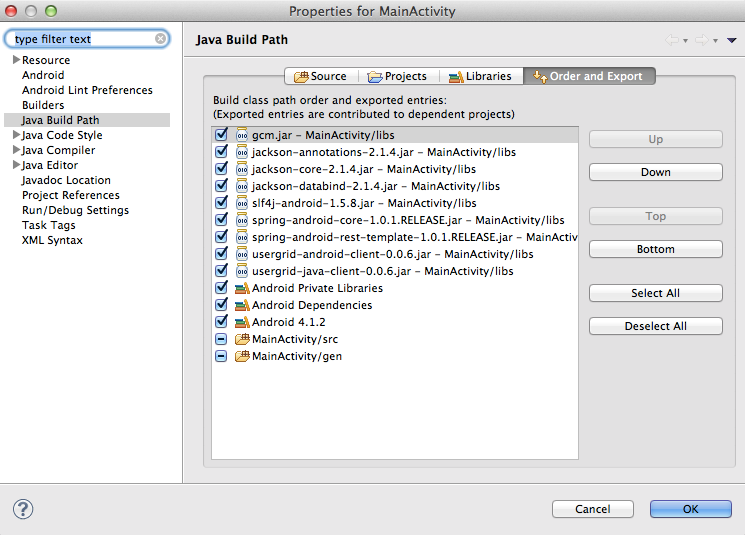 In your project properties, go to Java Build Path > Libraries and add all the JAR files from the project’s /libs directory. If you’re using an emulator, configure the emulator to use the Google APIs Level 16 target. Run the project as an Android Application. The IDE should compile the project and install the app on your device. Press the button on the app to send yourself a push notification. 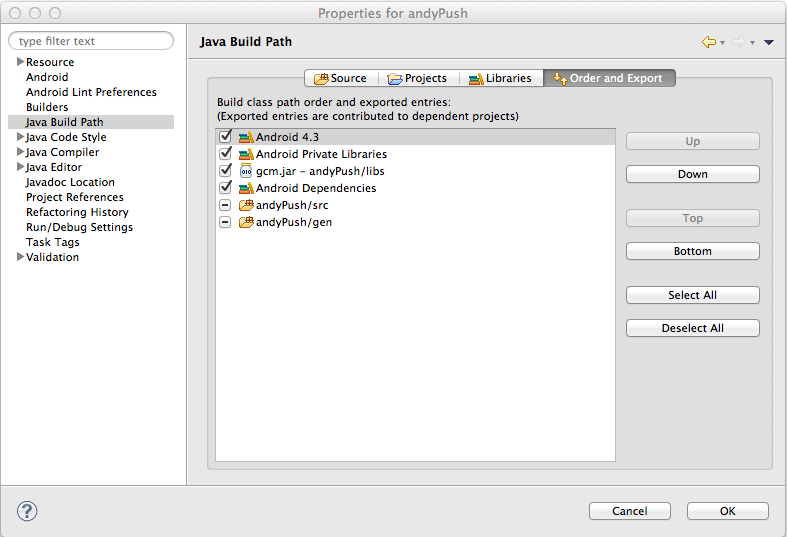 Import the PhoneGap Android sample app project into your IDE. notifier: Name of your notifier. senderID: Your API project number (the project must support Google Cloud Messaging for Android (GCM)), as described in the Registering with a notification service. In AndroidManifest.xml, be sure the proper Android permissions are included. This includes READ_PHONE_STATE and VIBRATE. If you’re using an emulator, configure the emulator to use the Google APIs Level 16 target or above. Also, be sure to see the Android requirements in Adding push notifications support for steps on setting up the emulator to support push notifications. When using PhoneGap to develop push notification apps, you use a PhoneGap plugin designed to support push notifications. That plugin is included in the Apigee samples. For more about the plugin, see the plugin’s GitHub project. Send a push notification from the Usergrid Notifications console On the Send Notification screen. Select your notifier, select All Devices, enter a message, select Now, and click to send it.